The objective of this article is to evaluate the efficacy and safety of potentised oestrogen compared with placebo in homeopathic treatment of endometriosis-associated pelvic pain (EAPP). This was a 24-week, randomised, double-blind, placebo-controlled trial that included 50 women aged 18 to 45 years with diagnosis of deeply infiltrating endometriosis based on magnetic resonance imaging or transvaginal ultrasound after bowel preparation, and scored ≥5 on a visual analogue scale (VAS; range: 0–10) for endometriosis-associated pelvic pain. Potentised oestrogen (12cH, 18cH and 24cH) or placebo was administered twice daily per oral route. The primary outcome measure was change in the severity of EAPP global and partial scores (VAS) from baseline to week 24, determined as the difference in the mean score of five modalities of chronic pelvic pain (dysmenorrhea, deep dyspareunia, noncyclic pelvic pain, cyclic bowel pain and/or cyclic urinary pain). The secondary outcome measures were mean score difference for quality of life assessed with SF-36 Health Survey Questionnaire, depression symptoms on Beck Depression Inventory (BDI) and anxiety symptoms on Beck Anxiety Inventory. The EAPP global score (VAS; range: 0–50) decreased by 12.82 (p < 0.001) in the group treated with potentised oestrogen from baseline to week 24. 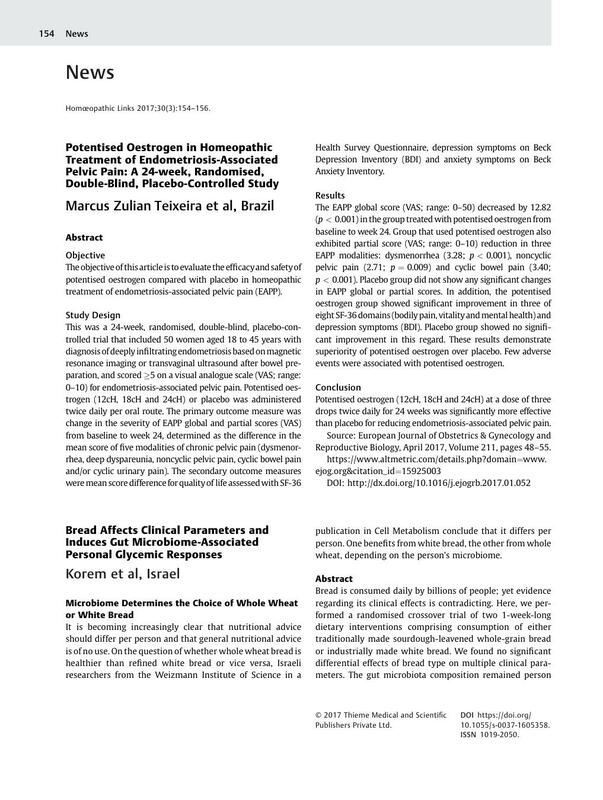 Group that used potentised oestrogen also exhibited partial score (VAS; range: 0–10) reduction in three EAPP modalities: dysmenorrhea (3.28; p < 0.001), noncyclic pelvic pain (2.71; p = 0.009) and cyclic bowel pain (3.40; p < 0.001). Placebo group did not show any significant changes in EAPP global or partial scores. In addition, the potentised oestrogen group showed significant improvement in three of eight SF-36 domains (bodily pain, vitality and mental health) and depression symptoms (BDI). Placebo group showed no significant improvement in this regard. These results demonstrate superiority of potentised oestrogen over placebo. Few adverse events were associated with potentised oestrogen. Potentised oestrogen (12cH, 18cH and 24cH) at a dose of three drops twice daily for 24 weeks was significantly more effective than placebo for reducing endometriosis-associated pelvic pain. Source: European Journal of Obstetrics & Gynecology and Reproductive Biology, April 2017, Volume 211, pages 48–55.